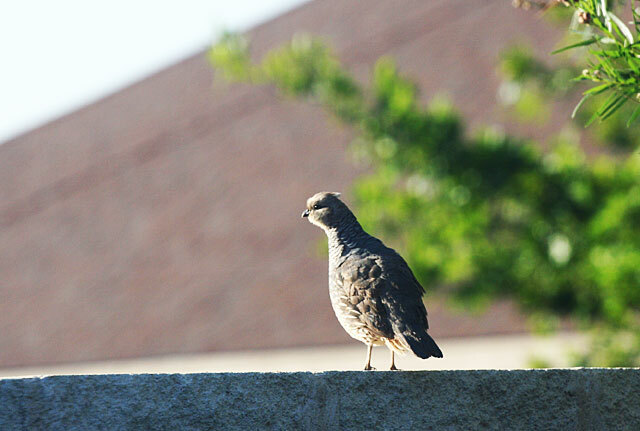 As an alert and perceptive Gazette reader, you no doubt recall this time last year when I undertook to stalk the wily blue quail residing in our landscape. I was able to see but not photograph the two baby birds that the adults were protecting. And shortly afterward, the entire family moved out, apparently tired of nosy neighbors. 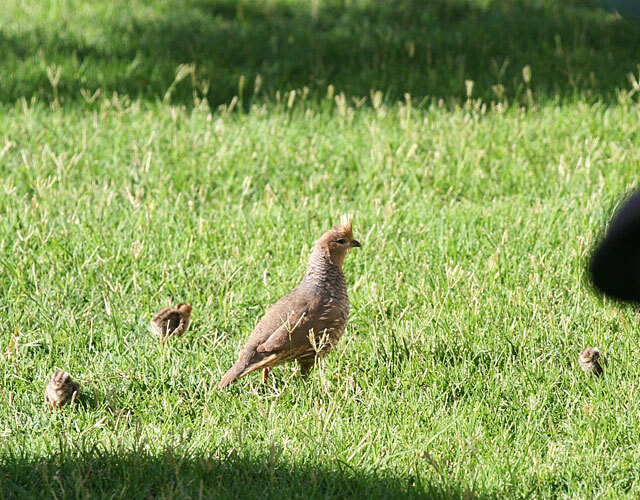 Well, I'm happy to report that either (1) they don't hold a grudge, or (b) the alternatives were even less hospitable, because the quail family is back...with a vengeance. After seeing signs of their dirt-scratching in our flowerbeds, we finally spotted the whole clan - two adults and nine (NINE!) 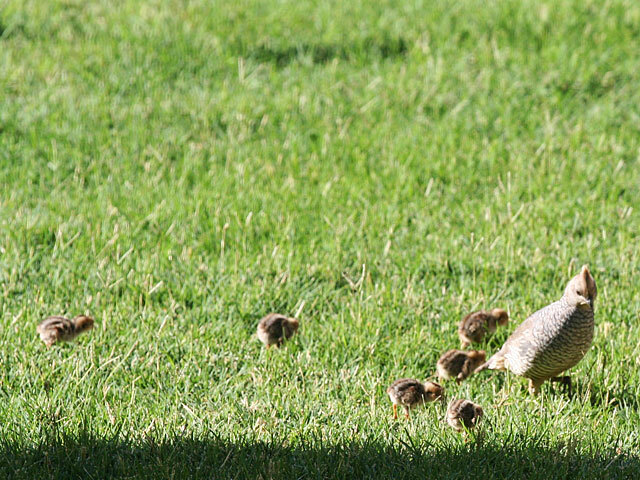 babies foraging in the lawn yesterday. Occasionally, one of the adults (the male, I'm guessing), took a break from scratching for lookout duty. That keen-eyed stare is designed to deter the most aggressive of predators, although he could possibly just be pondering the meaning of life. Anyway, I also managed to take the following 2 1/2 minute video of the industrious family. It's not the best footage - it was taken through some windows, between the slats of shutters, but I think the terminal cuteness of the babies comes through nonetheless. This page contains a single entry by Eric published on June 15, 2014 3:06 PM. I say manly affection; you say assault and battery. ToMAYto, ToMAHto. was the previous entry in this blog. Coming soon to a beach near you: OK, you don't really want to know is the next entry in this blog.